The Primary Care Rural Preceptorship Program (PCRPP) is a hands-on primary care experience designed to expose medical students to the professional, business and social aspects of practicing primary medicine in rural and/or medically underserved areas of Louisiana. The program provides medical students the opportunity to practice skills and techniques learned in the medical school classroom while developing an understanding of the values and goals of a primary care medical practice. Currently Louisiana has a shortage of family physicians, pediatricians and internal medicine physicians. Approximately 25 percent of the state’s population lives in rural area, however, less than 14 percent of the state’s physicians practice in rural and underserved areas. PCRPP seeks to increase the number of rural physicians by encouraging Louisiana medical students to return to rural communities after completing medical school to begin their medical practice. Central Louisiana AHEC sponsors medical students from LSU Health Shreveport, LSU Health New Orleans, and Tulane School of Medicine during their four week rotations the summer after their first year of medical school. 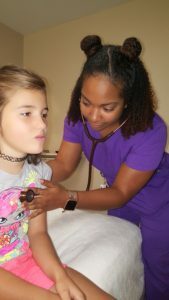 The students are placed with a physician practicing clinical medicine in a non-metropolitan area within CLAHEC’s 17 parish region in one of the primary care fields: Family Medicine, Internal Medicine, Obstetrics and Gynecology, or Pediatrics. To apply for the Primary Care Rural Preceptorship Program, first year medical students should check with their respective Medical School in December of each year. Applications are due at the end of January. Rotations take place during the summer following the first year of medical school. For additional information on this program in Central and South central Louisiana, please contact Gabrielle Juneau at gabrielle@clahec.org.